The principal aim of fiscal and monetary policy is to reduce cyclical fluctuations in the economic cycle. In recent years, governments have often relied on monetary policy to target low inflation. However, in recessions, there are strong arguments for also using fiscal policy to achieve economic recovery. Fiscal policy involves changing government spending and taxation. It involves a shift in the governments budget position. e.g. Expansionary fiscal policy involves tax cuts, higher government spending and a bigger budget deficit. Government spending is a component of AD. Monetary policy involves influencing the demand and supply of money, primarily through the use of interest rates. Monetary policy can also involve unorthodox policies such as open market operations and quantitative easing. 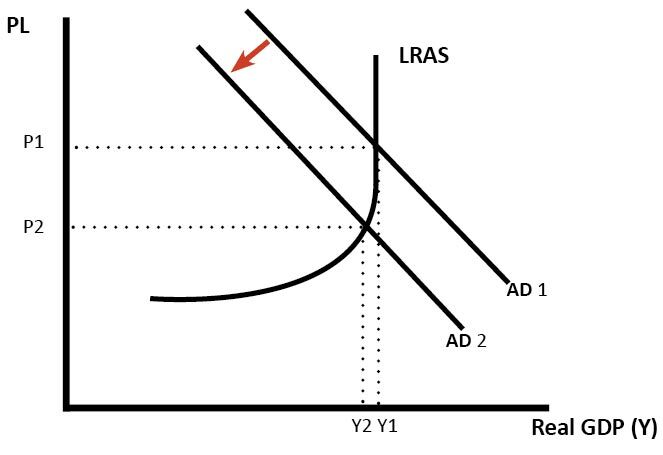 To reduce inflationary pressures, the government or monetary authorities will try to reduce the growth of AD. If we use fiscal policy, it will involve higher taxes, lower spending. The advantage of using fiscal policy is that it will help to reduce the budget deficit. 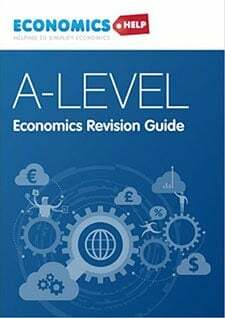 In a country like the UK, with a large budget deficit, it might make sense to use fiscal policy for reducing inflationary pressures because you can reduce inflation and, at the same time, improve the budget deficit. However, It can be difficult to cut public spending (or increases taxes) for political reasons. This is why most economies have relied on monetary policy for the ‘fine-tuning’ of the economy. Raising interest rates is usually quite effective in reducing inflationary pressures. Higher interest rates increase the cost of borrowing and tend to slow down economic activity. However, raising interest rates also affects the exchange rate. Due to hot money flows to take advantage of higher interest rates, the Pound is likely to rise. Therefore, deflationary monetary policy will have a greater effect on exporters. Also raising interest rates has a bigger proportionate effect on homeowners with variable mortgage payments. The high level of mortgage payments means the UK is sensitive to interest rate changes. Monetary policy has a disproportionate effect on the housing market and borrowers. However, higher interest rates can be beneficial for savers who will gain a higher income. SImilarly, the period of very low-interest rates reduces income of those who rely on savings. Therefore monetary policy doesn’t have an even impact throughout the economy; borrowers and savers will be affected differently. Fiscal policy is unlikely to affect the exchange rate. 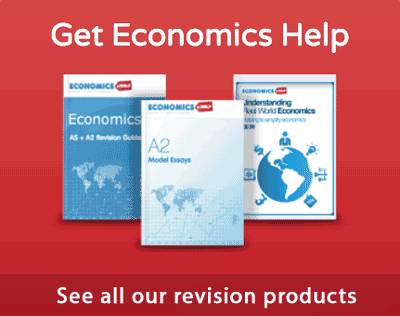 Higher income tax or corporation tax can reduce incentives to work. Business may not like the uncertainty of variable tax rates, and it may lead to lower investment. This is a reason why fiscal policy is rarely (if ever) used for controlling inflation. Cutting government spending could also harm capital investment or lead to lower benefits and increase inequality. In a recession, monetary policy will involve cutting interest rates to try and stimulate spending and investment. It should also weaken the exchange rate which will help exports. 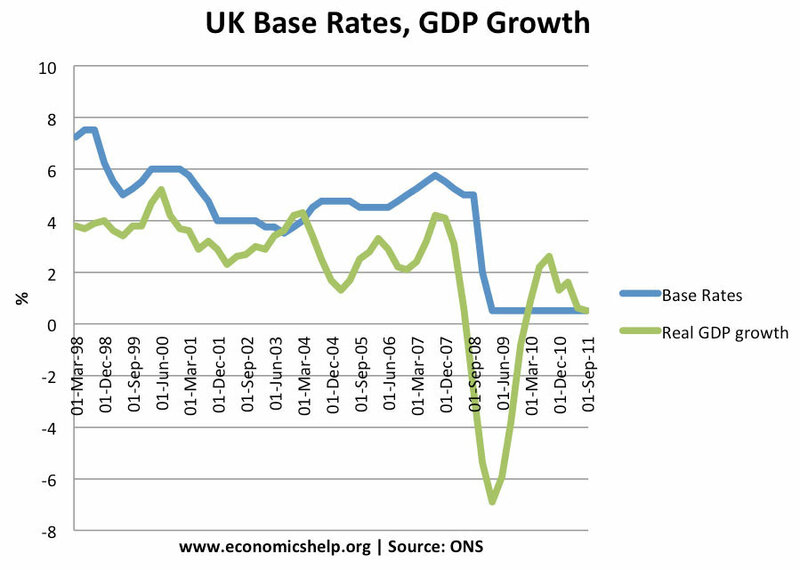 In the aftermath of the 1992 UK recession, a cut in interest rates (which allowed a devaluation in the over-valued Pound) was very effective in leading to economic growth. The 1992 recession was primarily caused by high-interest rates, so cutting interest rates reduced burden on homeowners and business and allowed the economy to recover. Banks had insufficient credit so were unwilling to lend – despite low-interest rates. House prices were falling reducing consumer wealth. With deflation, low-interest rates may be insufficient, because falling prices can still make real interest rates quite high. Therefore, in times of deflation, zero interest rates may not get an economy out of recession. In addition to cuts in interest rates, another tool of monetary policy is to pursue quantitative easing. The aim of Quantitative easing is to increase the money supply, reduce bond yields and avoid deflationary pressures. However, despite the increase in the money supply, the ongoing credit crunch caused banks to save the newly created money, and the effect on increasing growth was limited. 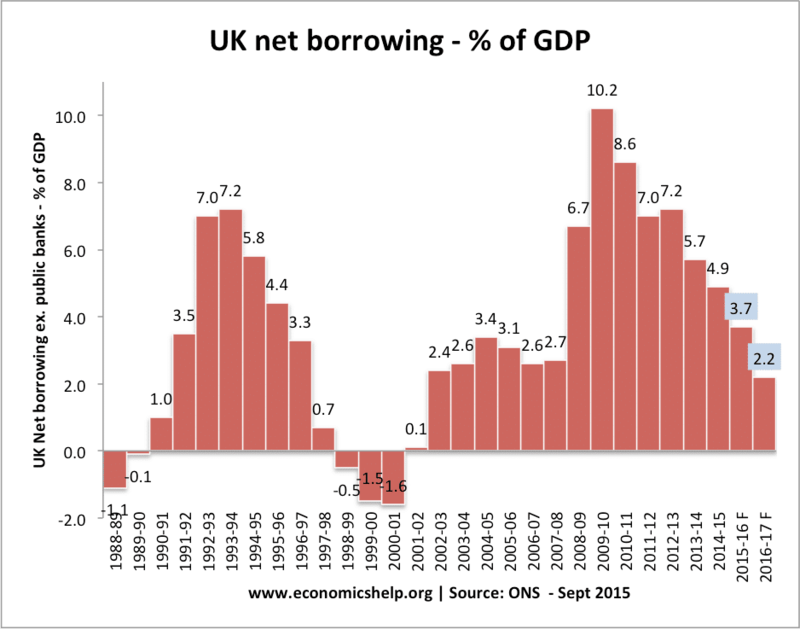 In 2009/10, UK government borrowing increased as they pursued expansionary fiscal policy. Expansionary fiscal policy can directly create jobs and economic activity by injecting demand into the economy. 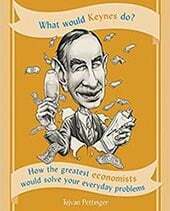 Keynes argued expansionary fiscal policy is necessary in a recession because of the excess private sector saving which arises due to the paradox of thrift. Expansionary fiscal policy enables unused savings to be used and idle resources to be put into work. In a deep recession and liquidity trap, fiscal policy may be more effective than monetary policy because the government can pay for new investment schemes, creating jobs directly – rather than relying on monetary policy to indirectly encourage business to invest. The drawback of expansionary fiscal policy is that it increases the budget deficit. 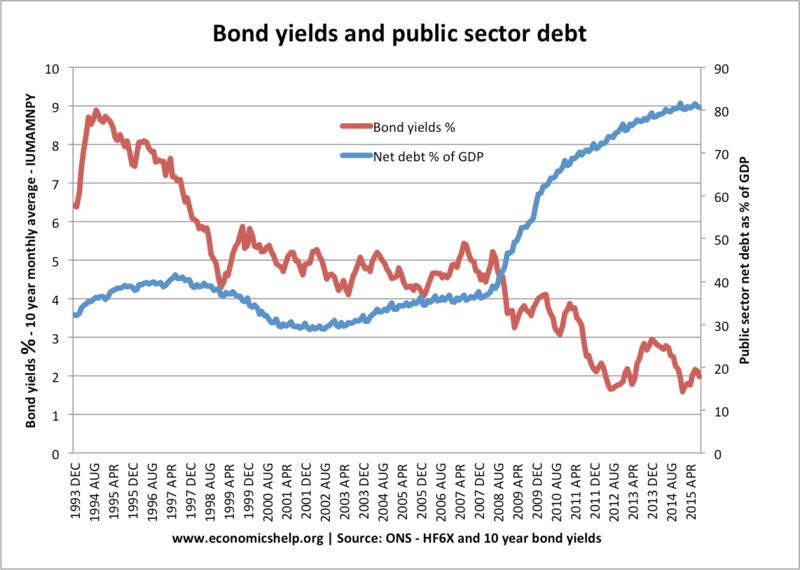 Some argue this can lead to higher interest rates as markets require higher interest rates to fund borrowing. During great recession (2008-15) Higher debt in the UK led to lower bond yields. It was a time when the government could borrow more. In theory, deflationary policy can reduce inflation. Higher income tax would reduce inflation. However, changing tax rates and government spending is highly political. Neither politicians or voters are likely to accept higher taxes on the basis it is necessary to reduce inflation. Interest rates set by an independent Central Bank help to take the political calculations out of demand management. In theory, a Central Bank would ignore political considerations and target low inflation. A government may be tempted to encourage an economic boom – just before an election. 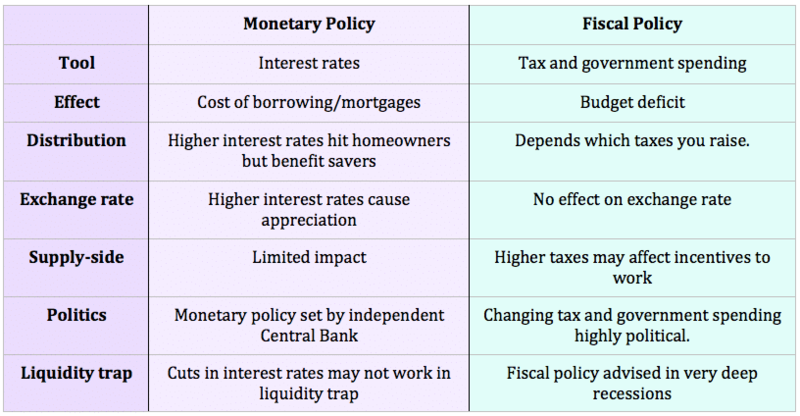 Which is best monetary or fiscal policy? 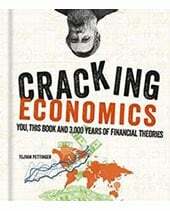 Monetary policy is most widely used for ‘fine-tuning’ the economy. Making minor changes to interest rates is the easiest way to influence the economic cycle. Deflationary fiscal policy is highly politically unpopular.However, in some circumstances, monetary policy has its limitations. In serious recessions, a combination of two policies may be needed. However, in some circumstances, monetary policy has its limitations. In serious recessions, a combination of the two policies may be needed. What about neither? The government that governs least governs best. Fiscal policy just creates crowds out private investment and monetary policy perpetuates disequalibrium. Let the markets work. letting the invisible hand determine is a very attractive option but what about when the market fails, of which history has taught us to involve our capitalisms with an tinge of public coordination. the truth in this case being that a fuse of both policies with a lot of policy checkers does the work. 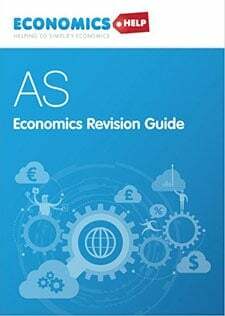 i want you to tell me how macroeconomi describes the economy in terms of macroeconomic variables, the objectives of macroeconomic policy, principal instrument of monetary policy, what is fiscal & monetary policy and outline a fiscal policy for a developing country. I want to tell you that Monetary policy is the actions of a central bank, currency board or other regulatory committee that determine the size and rate of growth of the money supply, which in turn affects interest rates. But Fiscal policy is related with spending money and taxation. I don’t think that the monetary actions are exclusively the role of financial institutions though they are the guiders. because every individual has some role in taking actions and responding as a reaction. I have this for an assignment and what I’m finding is that when it comes down to which one would be better suited for a recession. Honestly neither one is a smart option. One has a major draw back of creating more issue that is solving and the other may not be sufficient enough. But if you’d have to choose one fiscal policy makes more sense. The whole budget contains variety of variables such as, import, export, employment, inflation and balance of payment etc. These are important components of the fiscal and monetary policies. We are informed that monetary policy and Fiscal policy are real vehicles of economic growth. Examine the validity of this statement and do analysis of the macro-economic variables. Pls, how can u explain to me with examples how the regulatory authorities apply monetary and fiscal policies in controlling the flow of money in the economy.